How Much Did Isabelle Duterte's Debut Cost? Isabelle Duterte's Debut: How Much Did It All Cost? Here's an estimated cost breakdown of the most talked about debut in the PH. Isabelle Duterte recently made headlines because of her lavish 18th birthday celebration. Her dream debut held on January 19 at The Peninsula Manila drew mixed reactions from netizens. Some were scandalized by her extravagant celebration because her grandfather (President Rodrigo Duterte) upholds simple living. Others deemed it insensitive: "Ang dami kasing nagugutom na Pilipino." Some were nonchalant: "Pera naman nila iyan, eh." The debutante is the daughter of former Davao City Vice Mayor Paolo Duterte with his estranged wife, businesswoman Lovelie Sangkola Sumera. When photos from Isabel's pre-debut shoot were going viral and drawing flak for being over-the-top, photographer Lito Sy announced that it was not Isabelle's father who paid the suppliers. Part of Sy's post read, "It was not Paolo Duterte who paid for the suppliers because Isabelle's mother is a businesswoman." He also said that the gowns were either sponsored or borrowed. After Isabel's debut, the burning question on social media was: How much did it all cost? PEP.ph (Philippine Entertainment Portal) came up with an estimate based on research and inquiries with events suppliers. Rita Neri Events Planners (RNEP) group took charge of the overall planning of Isabelle's grand debut. According to two sources, the group charges from P80,000 to P150,000 for a wedding in Manila. Event stylist Rob Blancaflor filled the Rigodon Ballroom with tulips, parrot tulips, roses, Ecuadorian roses, hydrangeas, liliums, peonies, amaryllis, and hyacinths, among many varieties. A highlight of his design was the floral tunnel with a transparent walkway, which became the most Instagrammable portion of the venue. The crystal chandeliers were also a visual treat. Rita Neri Events Planning uploaded a video of the set-up on Instagram and wrote, "Tonight's ceiling treatment for our debut. Just elegant and classy." Blancaflor gave his followers a closer look at the details of his tablescape and wrote: "Isabelle [likes] pastels so we created a room full of white and blush using Dainty centerpieces, candelabras, and an elaborate ceiling Design using #AllFresh Flowers and Foliage with candelabras and other installations. "The tables were mirrored and clear with gold beaded show plates and clear, transparent chairs." The presidential tables were toned down but still boasted imported flowers. Blancaflor wrote, "For the #BELLEssima18 presidential table (using our mirrored glass table), we opted to go low in terms of floral designs using the best flowers available this season such as peonies, hyacinths, feathered tulips, David Austins, and amaryllis." According to four sources, Blancaflor charges at least P300,000, and one of the four speculated that the much-sought-after Blancaflor could have charged P500,000 on this debut. 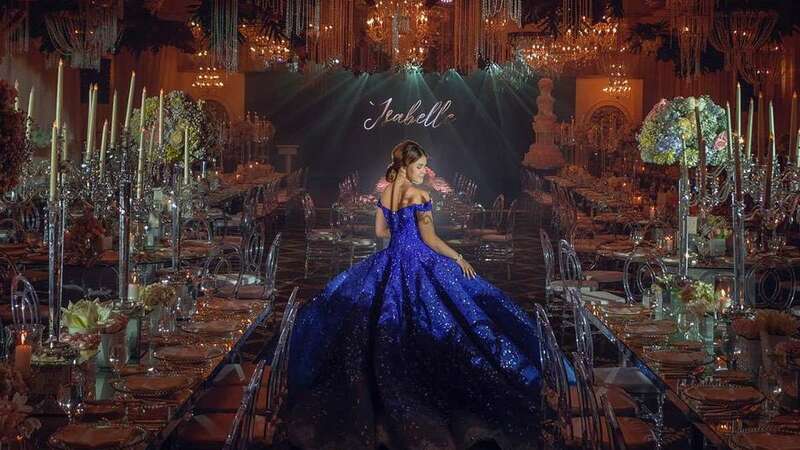 Isabelle made her grand entrance in an ombre cobalt blue ball gown by Michael Cinco adorned with "full degrade Swarovski crystals." According to a blogger who had contacted the Cinco atelier in Dubai, the base price for his couture gowns is AED60,000 or at at least P830,000. PEP.ph estimates that her ball gown could cost at least P1.5 million, or a little less than Marian Rivera's Cinco bridal dress, which reportedly cost P2 million. Isabelle also sought the help of celebrity stylist Jeff Galang for her wardrobe changes. According to the Our Budget Wedding website, Galang charges a minimum of P25,000 for his services, which include clothes rental. But a source told PEP.ph that Galang's package rate, inclusive of rates for the shoots, were more likely to range from P80,000 to P100,000. For her party, Isabelle wore a bespoke robe by La Tercera, a couture dress by Michael Leyva, an all-white lace dress by Joe San Antonio, and a tailored Orias Studios pantsuit. The Presidential granddaughter also had three custom-made shoes by Jefferson Si, whose base price for basic designs is at least P9,000, according to one of his clients. In an exchange with Galang on the comments section of his Facebook account, Si mentioned that the base price was "50 percent off." So, if one pair costs P20,000, the total would be P60,000. And as for her glam team, Winn Ramos did her makeup and Allan Vicentico worked on her hair. Average industry rates on premium packages for a debutante's hair and makeup could go as high as P50,000. The Peninsula Manila Hotel prepared a five-course meal for dinner. The guests were served seared jumbo lump crab cake as starters and wild mushroom bisque soup. They also enjoyed two entrees: angel-hair aglio oglio and 12-hour braised U.S. boneless beef short rib. They ended their meal with classic Napoleon for dessert. The Manila Peninsula requires a minimum consumable amount of at least P1 million for the use of the Rigodon ballroom. We also learned that the four-layer birthday cake, made by Penk Ching of Pastry Bin, roughly cost P130,000. Professional audio-visual equipment provider Forsc Ink Inc. took charge of the lights, sound system, and LED wall for the event. A sounds and lights supplier estimated the base cost of Forsc Ink's services at P250,000. In a phone conversation, he said, "The pictures did not show how many trusses were used. To give the readers an idea, one vertical structure alone would cost around P60,000. I based the cost on the venue size, not a client's requirements." The Manila Philharmonic Orchestra (MPO) provided the music for the event. Upon inquiry, rates depend on the number of musicians and set. The orchestra charges from P30,000 to P50,000 for wedding and debut gigs. DJ David Callum, who was tapped to spin the party music after the program, usually asks for a fee of P80,000. The photo and video coverage of Isabelle's debut was done by one of the country's top events photographers, Lito Sy. According to his website, his gold package services—which include photo and video coverage plus an "exclusive 12×16 inches Artist's Choice album" edited by the photographer himself—costs P290,000. Two lucky guests were chosen as best-dressed guests and took home Hermes items as prizes. 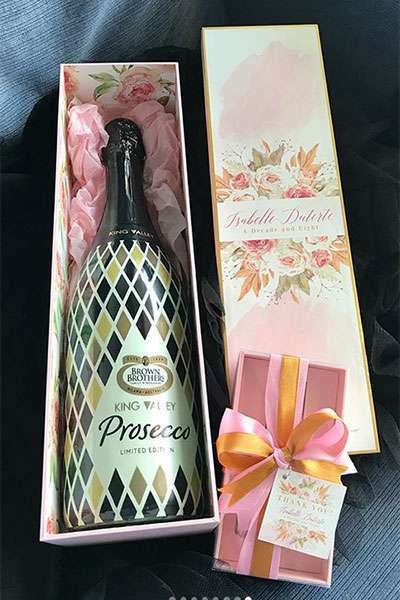 The guests also received Limited Edition Prosecco Wines by Brown Brothers with custom-made boxes. Based on the Brown Brothers' website, a 750ml Limited Edition Prosecco wine is priced at $18.80 per piece or at least P1,000. With 250 guests, the total cost for wines would come up to at least P250,000. Smitten Fragrances customized the perfume. Upon inquiry, each bottle costs P250. A printing supplier quoted the base price for the packaging (box, sticker, and ribbon) of the wine and perfume at P150 each set. In total, the estimated price is at least P100,000. Based on a previous inquiry, Print Divas' LED invites cost P2,500 per piece depending on quantity. If Isabelle sent out 300 invites, the estimated cost would be P750,000. Print Divas also made the invites of MOA debutante Dian Serranilla last year. The cost for a debut as grand as Isabelle's can run up to P5.1 million. This is the minimum, barring exchange deals, wholesale prices, and free services from suppliers. This cost estimate does not include the expenses of Isabelle's pre-debut shoots.